How Do You Calculate Air Conditioner Size? 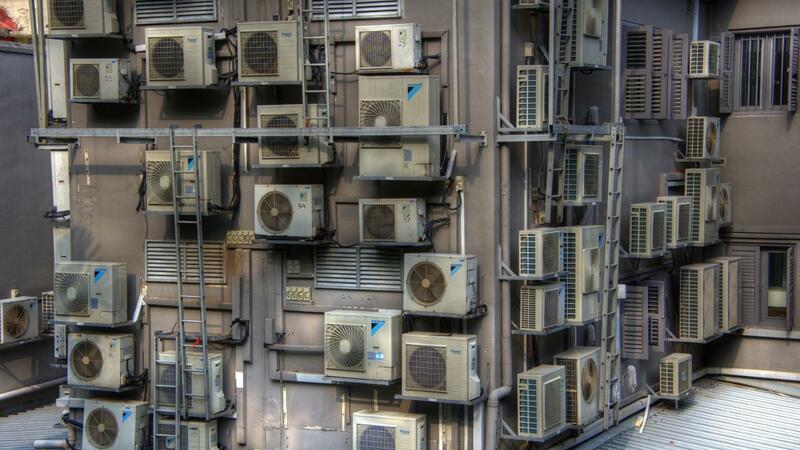 Determining the appropriate size for an air conditioner ensures proper and effective function. If the unit is too large, it cools the room but doesn't properly remove humidity, resulting in a damp or clammy feeling. Conversely, a unit that is too small doesn't sufficiently cool the room. Measure the length and width of the room. Multiply these numbers to determine the square footage of the room. As the necessary number of BTUs varies greatly and is dependent upon the total area of the room, review a chart or a calculator to determine the size of the air conditioning unit that provides the best fit. These calculators can be found online. Area is not the only determining factor for a properly sized air conditioning unit. If the room is shaded well throughout the day, reduce the number of BTUs needed by 10 percent. If the room is in direct sunlight, increase the number of BTUs by 10 percent. If the room in question is used regularly by more than one person, add an additional 600 BTUs per person. How Much Do Trane XB14 Air Conditioners Cost? What Is a Good Size Air Conditioner for an Apartment? How Much Energy Does Air Conditioning Use? Why Won't My Central Heating Work? Does Bryant Make Commercial Air Conditioners? Where Do I Find Prices for Air Conditioning Repair in Dallas? How Many Watts Does a 5000-BTU Air Conditioner Use?